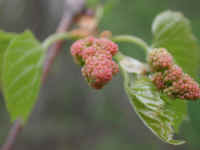 (Wild Grapes (Vitis spp) - 11) In the spring of the year, when the leaves begin to open, the wild fox grape sends forth its flower buds. (Wild Grapes (Vitis spp) - 12) The is a close-up look at the end of one of the wild grape flower bud clusters. 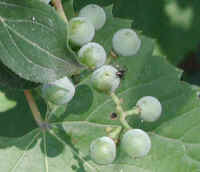 This grape is a northeastern variety of wild grape. (Wild Grapes (Vitis spp) - 13) Because the bud clusters of the grape are very small, it is difficult to get a close-up picture with everything in focus. (Wild Grapes (Vitis spp) - 14) This photo shows the shape of the newly opening leaf of the wild grape with its three lobes and toothed edge. 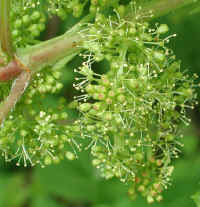 (Wild Grapes (Vitis spp) - 15) The grape buds grow very rapidly and soon open, even before all the leaves are fully open. 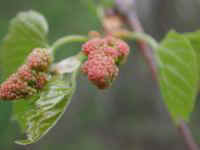 In the background are the flowers of a wild berry. (Wild Grapes (Vitis spp) - 16) This is a bee's eye view of the open grape flowers. 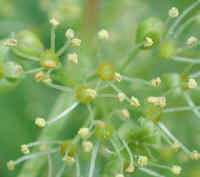 The pollen grains are clearly visible on the anthers at the end of the stamens. (Wild Grapes (Vitis spp) - 17) This is another bee's eye view of the wild grape flowers. 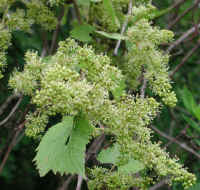 (Wild Grapes (Vitis spp) - 01) As the season progresses, the leaves open completely and the wild grape clusters develop. (Wild Grapes (Vitis spp) - 01a) The developing grapes attracted not only this photographer, but also an ant who came to inspect them. 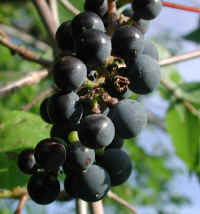 (Wild Grapes (Vitis spp) - 02) This wild grape vine supports itself on the surrounding trees and bushes. 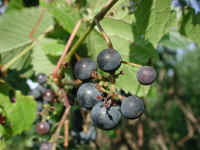 (Wild Grapes (Vitis spp) - 02a) As the wild grapes continue to mature, they develop their purple color. 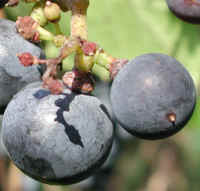 The exterior of the grapes have a dull coating which may be wiped off easily. 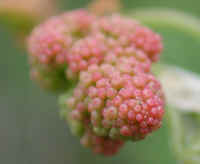 (Wild Grapes (Vitis spp) - 03) This is a close-up look at the developing grapes. 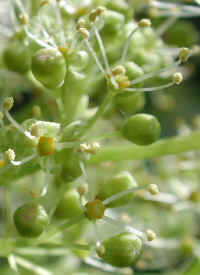 Also note how many of the grapes on the cluster never developed. 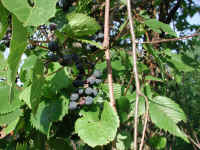 (Wild Grapes (Vitis spp) - 04) These grapes are still quite sour tasting. In the fall, when the weather is colder, the grapes sweeten; but then, for a taste, we're in competition with the birds and other animals. 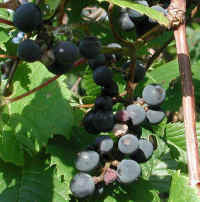 (Wild Grapes (Vitis spp) - 05) These grapes have turned almost black and are beginning to develop a sweeter taste. 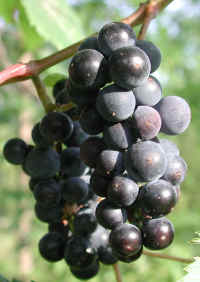 Though much smaller, grapes remind us of the commercial concord grapes. (Wild Grapes (Vitis spp) - 06) This is another close-up of the mature wild fox grapes. 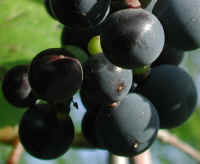 The actual size of a wild grape is only about 1/4 inch in diameter. (Wild Grapes (Vitis spp) - 07) These are two of the fullest clusters of wild grapes that we encountered. (Wild Grapes (Vitis spp) - 08) With the coming of Autumn, the changing of colors, and the shedding of leaves, the remaining wild grapes have become like sun dried raisins. To us, it's God's way of preserving food for the animals, when other food is no longer available for them. (Wild Grapes (Vitis spp) - 08a) This is a closer look at some of the remaining clusters of grapes that are becoming raisins. 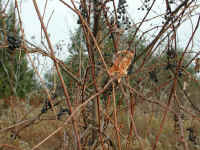 (Wild Grapes (Vitis spp) - 09) These are some more of the remaining clusters of wild grapes. Some have begun drying into raisins, while others retain their grape roundness. 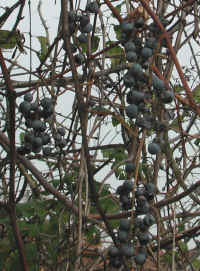 (Wild Grapes (Vitis spp) - 09a) These are a few more of the remaining grape clusters that have not dried into raisins. (Wild Grapes (Vitis spp) - 10) Even after the leaves have fallen, the remaining grapes add splashes of color from God's magnificent paint brush. 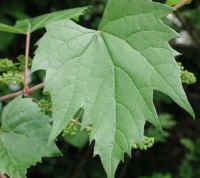 (Wild Grapes (Vitis spp) - 18) This wild grape leaf has a hairy stem, edge and underside. Some of the other species we have seen are smooth. (Wild Grapes (Vitis spp) - 18a) In this close up look at the wild grape leaves and stems, we can see that there are no hairs on the top of the leaves, but they do fringe the leaf edges. 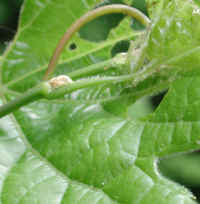 The hairs are also on the leaf stems, but not on the vine. 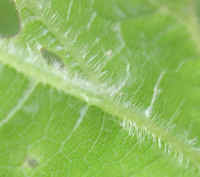 In the upper right of the photo, we can also see that the underside leaf ribs are also hairy. (Wild Grapes (Vitis spp) - 19) This is a close up look at the hairs on the underside ribs of this wild grape leaf. (Wild Grapes (Vitis spp) - 20) New grape clusters and leaves branch off the wild grape vine. 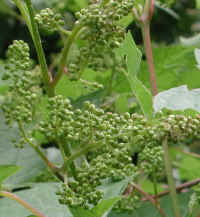 (Wild Grapes (Vitis spp) - 21) This wild grape vine is "loaded" with clusters of grape flower buds. (Wild Grapes (Vitis spp) - 21a) This is a closer look at some of the clusters of wild grape flower buds. 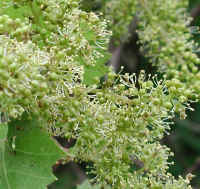 Each fertilized flower produces a grape. 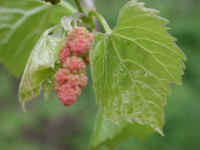 (Wild Grapes (Vitis spp) - 22) A wild grape leaf opens like a canopy over the grape flower bud clusters. (Wild Grapes (Vitis spp) - 23) This is a close up look at the structure of a portion of a wild grape leaf as viewed from the underside. 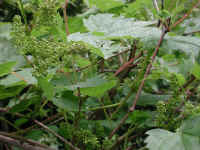 (Wild Grapes (Vitis spp) - 24) As the wild grape vine grows, it sends out tendrils that twirl around other plants and objects to support its weight, since it is not strong enough to support itself. (Wild Grapes (Vitis spp) - 24a) This is a close up look at the wild grape tendrils. 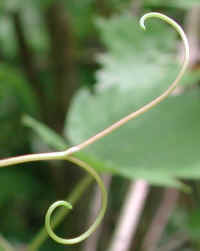 Once they find something to twirl around, they tighten around the object and the tendrils harden. 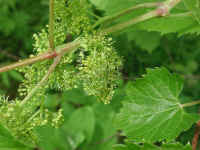 (Wild Grapes (Vitis spp) - 25) These grape flowers are just beginning to open. 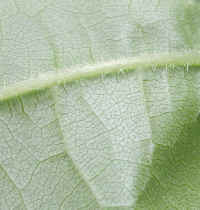 Notice that the newly opened leaf does not have the deep lobe notching of the older leaves. (Wild Grapes (Vitis spp) - 25a) This is a closer look at some of the wild grape flowers. (Wild Grapes (Vitis spp) - 26) This is another photo of the wild grape flowers. (Wild Grapes (Vitis spp) - 26a) This is another close up look at some of the wild grape flowers. (Wild Grapes (Vitis spp) - 27) This is another look at some of the wild grape flower clusters. (Wild Grapes (Vitis spp) - 28) More wild grape flowers.